Vivo Philippines co-presented the recently concluded Bloggers United PH 2018. 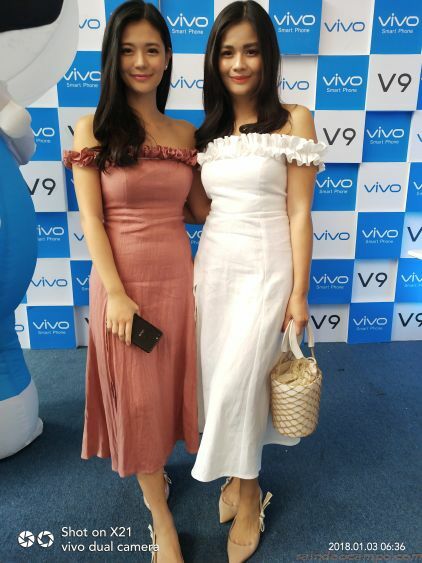 Held last June 10, 2018 at the World Trade Center, Vivo endorsers and blogger-sisters Vern and Vernice Enciso were present at the event and revealed their number one secret for taking Instagram-worthy photos, the phone brand’s most future-forward smartphone – the Vivo X21. During their visit to the Vivo booth, the sisters Enciso also imparted their travel tips such as must-bring travel essentials plus other essential tips on effective blogging. They also revealed that for Instagram-worthy photos, the new Vivo X21 definitely delivers the goods. Vivo is popular for pushing the boundaries in terms of innovation. Their latest offering, the Vivo X21 is something straight out of science fiction. With its impressive under-glass fingerprint sensor complemented by other state-of-the-art offerings such as an impressive 19:9 Fullview Display which produces a more immersive mobile video-watching and gaming experience, and an AI Face Beauty-enabled camera that boasts of dual pixel sensors which creates vivid pictures whether in low-light or backlight situations—perfect for everyone’s travel shots. The new Vivo X21 smartphone is also equipped with Vivo’s latest pride: the AI-powered Super HDR technology. Committed to bringing flawless photos, the Super HDR is an upgrade of the regular HDR but merges more frames to resolve the problems presented by contrasting strong dark and light tones in a photo so one can take shots anytime, anywhere. Bloggers United PH was a one-day, 90s era inspired affair with loads of surprises for attendees. Co-presenter Vivo even gave away one unit of Vivo X21 to one lucky blogger.